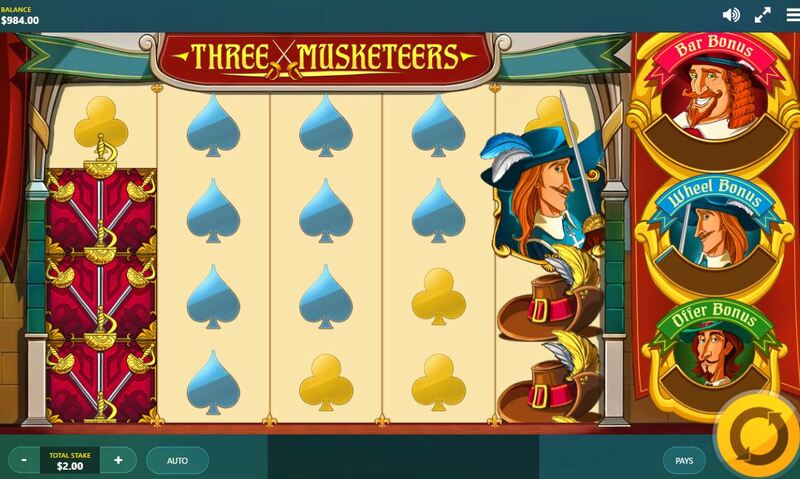 Three Musketeers slot was something Dumas would never have imagined as a vehicle for his famous novel about young D'Artagnan and his friends the musketeers Athos, Porthos and Aramis. Naturally they all have a part to play here in this cartoon-style representation with sounds of swords clashing, medieval music and the soundbites in French when one of our three heroes lands on the grid. The reels are set in a curtained castle archway and feature the Musketeers on the right for reasons which will soon become apparent. So will you end up respecting them like D'Artagnan did? Unusually for Red Tiger we dispense with the 20-line game and here we have 40 lines over 5 reels and 4 rows, similar to their Totem Lightning game. We do keep the stacked symbols though (except for the Musketeers) and the gold Fleur De Lys pay 10x the 20-coin bet for a 5-of-a-kind followed by the 3 Swords at 6x, the Feathered Hats at 3x and the Musketeers' 2fuel, the Beer at 1.5x bet for the 5. The card icons all at 0.8x bet make up the remaining symbols. There are no triggering scatters as such but we do see Athos, Porthos and Aramis singly on the reels; remember me mentioning the 3 Musketers sitting on the right of the grid? Well each has a meter which partially fills every time one appears in view, thus the features are triggered cumulatively like the free spins can be in Yggdrasil's Vikings Go Berzerk slot. You may also be wondering about the lack of Wild talk and that's because they don't appear naturally on the reels but only when Athos, Porthos and Aramis randomly decide to slash at the reels with their swords - they will do this increasingly as their respective meters get more full too. You can get a 5-of-a-kind Wilds like this which pays 15x bet. 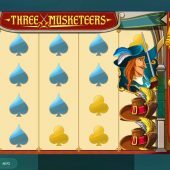 Porthos Bar Bonus - choose from Fleur De Lys to advance and pick up cash and hopefully make the right choices to lead to a treasure boxes holding the big prizes. Maximum win 2000x bet. Aramis - Wheel Bonus which contains some good and lesser stake multiple awards. 888x bet possible. Athos - Offer Bonus whereby he unrolls a scroll showing a cash prize and you can accept his offer or turn it down, but only twice.